I won't try to identify it,but I do know that it is a fantastic shot.Juveniles do pose a problem. I know little about birds, but this one definitely has a hawk face. Looks like a red-shouldered hawk to me. Looks like a red-tailed to me. 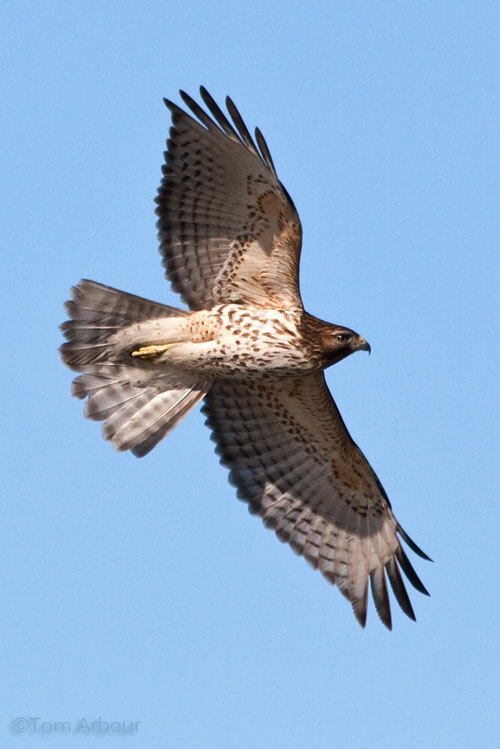 Juveniles lack the red tail. Beautiful shot regardless. AWESOME photo! Possibly a broad winged hawk, or red shouldered hawk. Not many juvenile photos of that perspective to compare to. I won't make a definitive call without my Sibley at hand (I'm away from home at the moment), but I lean toward juvie Red-shoulder. Mostly because the bands on the tail are narrower than I associate with Red-tails (though SuziQ is right in pointing out that juvie Red-tails lack the red tail). Also, the breast streaking uniformly covers the breast in this bird, and in Red-tails it usually forms a band of speckling about halfway down the breast. I think Red-tails also have white chins, but don't quote me on that. Thanks everyone- Jeff Gordon via twitter says this is a "slam dunk" juvenile red-shouldered hawk. Thanks Jeff, and thanks everyone for taking the time to analyze this flying creature. I have a new found appreciation for raptors since purchasing a super-telephoto lens. Since raptor ID isn't often compatible with Twitter's 140-character limit, I'm answering your request for more detail on why this is a Red-shouldered Hawk here rather than there. But it turns out that even almost 5000 characters isn't quite enough, so I've had to break this comment into 2 parts, believe it or not. First, let me clarify that when I tweeted that this bird is a "slam-dunk" Red-shouldered, I wasn't meaning to say that anyone who suggests otherwise is a bad person or a bad birder or a bad anything. I used that language for 2 reasons: first and most important, the above-mentioned space limitations and, second, a desire to indicate that, though everyone is entitled to their opinion, I'm pretty darn sure that mine is correct in this case. I understand other people finding this picture difficult to identify with certainty--I see lots of photos that are tough for me to ID. But this isn't one of them--again, speaking only for myself. I should also add that juv Red-shouldered vs. juv Broad-winged can be tricky, for sure. I feel like I've finally got a handle on it, but it used to vex me greatly at times. So, what makes me so sure? Here are a few thoughts/impressions. I'll restrict the field to Red-shouldered, Red-tailed, and Broad-winged, as nobody seems to have suggested any other possibilities. All agree that this is a juvenile, so I'll stipulate to that. I'm also going to abbreviate the 3 candidate species hereafter as BW, RS, & RT. 1. A compelling argument against BW is that the photo was taken on March 7th in Ohio. Though winter BWs have been recorded north of South Florida (where they are regular in small numbers), they are *exceedingly* rare. Date & location are fine for RS & RT. 2. Wing shape looks great for RS and much less good for the others. The wings are too narrow, with not nearly enough bulge in the secondaries for RT, but they show more secondary bulge than BW. Also, the wingtips are not as pointed as in BW--several of the primaries here seem nearly equal in length, giving the wing tip a squarer look. 3. Tail pattern and shape favor RS. The tail is banded with nearly equal-width light and dark bands, though there's a thicker pale subterminal band and a slightly thicker dark terminal band. RT juv's tend to have mostly pale tails with a profusion of narrow dark bands. Juv BWs also have more white than dark on the underside of the tail, but often show a big blocky dark terminal band quite unlike this bird. Even though the tail is mostly spread, it still seems longish, again better for RS than the others. 4. The bird lacks the bold brown patagial bars that are the most consistent plumage mark for RT. Many (but not all) Eastern RTs would show a white-chested, dark bellied look, too, entirely different from this bird. 5. Most BWs would show much less dark marking on the secondaries, and less extensive black tips on the primaries. 6. Body plumage is highly variable in all 3 species; still, the combo of extensively brown cheeks and even, spangly streaks looks perfect for RS. 7. Though some BWs can look a bit washed with tawny, the colorful wing linings, as well as the brownish flanks are highly suggestive of RS. Finally, a word about what *isn't* seen here--translucent, crescent widows at the base of the primaries. This is the classic mark for in-flight RS and its apparent absence here is why, I would guess, people aren't immediately recognizing this bird. Had the sun angle been different here and those crescents "popped," we probably wouldn't be having this discussion. But the crescent windows on RS don't always show. Here, we have low angle light coming from behind and below the bird, exactly wrong for seeing the window effect. Even though they're opaque, we can still see where they are, though, especially on that lower wing--there's a nice pale slash between the blackish wing tips and the markings on the inner primaries and wing linings. Finally, I want to say that I didn't just pull all that detail above out of my head word for word--I consulted several references to make sure that I was remembering and stating things correctly. But even though I couldn't have precisely articulated each point from memory, knowing those things at some level enabled that snap judgement of "slam-dunk Red-shouldered." To me, this is how field ID works--you watch a species long enough and you just start to recognize it, even if you can't immediately point to each micro-detail. Your excellent photo invites just this sort of analysis, though, which would often be difficult or impossible in the field. And that's always a valuable exercise, no matter how long one has been birding. Thanks for sharing the photo. If anyone has questions or would like to raise other points, I'll try to answer.